LONDON, England (CNN) -- "Relegation" is a word that is laced with horror for many football fans in European and Asian nations -- yet for others it remains a complete mystery. 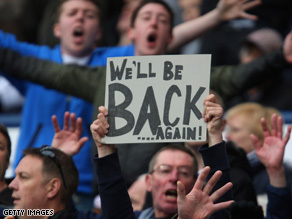 The latest victim of the relegation sword is English Premier League team West Bromwich-Albion. After a 2-0 loss to Liverpool on Sunday, West Brom faces a drop to the division below. Promotion/relegation systems similar to the English Premier League's model work in many football leagues around the world, and have allowed dreams to come true for many aspirants, while they have also crushed the hopes and futures of others on the decline. While these systems have been long-running in Europe; in the U.S. -- the home of the meritocracy -- there is still no promotion or relegation to or from the top-flight Major League Soccer (MLS) competition. This is the case for the many sports in the U.S., as well as competitions in Canada and Australia. For those who have not experienced promotion/relegation systems, they can appear slightly confusing. For people who do know of the concept, you may be unaware there are multiple different models operating in the world's top leagues. The basic principle of the system is to transfer teams between divisions based on merit -- in order to allow fluidity between the amateur leagues and the very top of the professional game. Do you think promotion/relegation systems are a good or bad idea? Share your thoughts in the Sound Off box below. In England's Premier League, for example, at the end of each season when competition points have been accrued, the three bottom-ranked teams will be relegated (demoted) to the level below (in England's case the second-tier Championship). Meanwhile, the top teams from the Championship will be promoted up to the Premier League to fill the places of the relegated sides. This promotion system has two aspects. The top two teams are automatically promoted, while the third-to-sixth placed sides play-off for the third promotion spot. In Spain's La Liga and Ligue 1 in France the system is simpler with the bottom three and top three teams automatically relegated and promoted respectively. Germany's Bundesliga has two teams going up and down, with a play-off match between the third-bottom and third-top team from the first and second divisions. Italy's Serie A has a similar structure to England, however, if the third-placed team in the second-tier has a ten point or greater gap on their nearest rival, then they automatically go up. So, why don't the U.S. have such a system? According to MLS Commissioner Don Garber the competition currently lacks the size and power to take on promotion/relegation. "Unfortunately our country does not have the infrastructure to support promotion/relegation at this time. We'll continue to monitor this, but it will likely be at least 10 years before promotion/relegation could be considered," Garber said in a response to the question on the MLS web site. Many of the clubs in the United Soccer Leagues (which is the next competition below the MLS), lack the same fan-base and infrastructure that MLS clubs possess. For the relegated West Brom side which faces next season in the second-tier competition, their plight doesn't necessarily mean complete club failure. Dan Jones, partner in the Sport Business group at accountancy firm Deloitte, told CNN that relegated Premier League clubs received a "parachute payment" of $18 million (£12m) for each of the next two seasons -- which in many cases was enough to help them bounce back up to the top-tier. Jones said the relegation certainly didn't condemn them to financial failure either. "West Brom consistently post one of the healthiest operating profits in English football," he said.